You don’t need an excuse to try a new recipe, but here’s one anyway. A site called ChefSteps has taken a scientific approach to baking really good chocolate chip cookies. 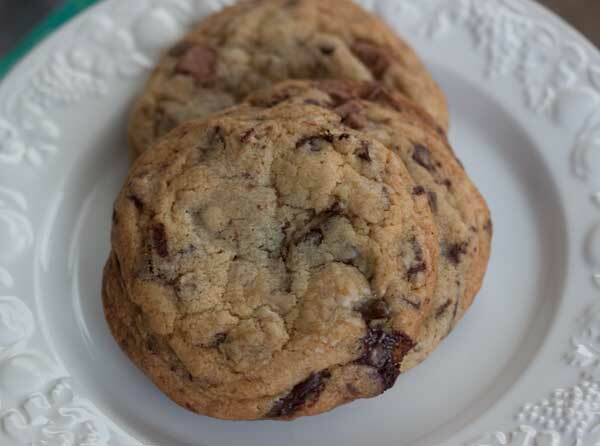 This has been done of course, but the ChefSteps Chocolate Chip Cookies article offered some new insight. First, they claim pastry flour works better than all-purpose. 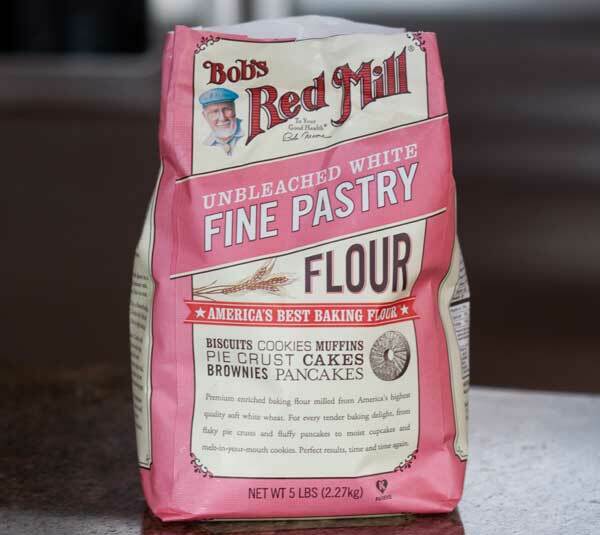 I don’t believe that 100% because King Arthur claims their all-purpose flour is always consistent, but it made me go out and buy a big old bag of Bob’s Red Mill pastry flour. In the past I’ve always made chocolate chip cookies with bread flour, cake flour, a mixture of both or all-purpose. Now I have some new flour to play with! I like the pink bag, too. In the ChefSteps Chocolate Chip Cookies, the baking soda and salt are added with the creaming mixture. King Arthur does this as well in some of their recipes. It goes against the old standard way of mixing the dry ingredient and adding at the end, but the theory is that the leavening should be more evenly dispersed. They validate something I read in an old issue of Cook’s Illustrated about why eggs should be added slowly, and they advise to press the cookies down as soon as they come out of the oven for dense, chewy, crackled looking cookies (an optional step). Best of all, they put the whole recipe in grams. Have you ever noticed how all the user photos posted on popular sites show cookies that look like they came from completely different recipes? Using weights for recipes allows for so much more precision, and if you look at the pictures posted on ChefSteps by people who baked the cookies, the cookies are more or less the same. That is, they are medium thickness, have a slight gloss to them, are cracked and bakery style. Since different brands of ingredients sometimes result in different products, here are the brands I used to make the cookies. It’s especially important to know the brand of salt, because brands vary in levels of saltiness. I used a teaspoon of Morton kosher (the blue box). Now that I’ve made one excellent batch, I might try again using a fancy, high end brown sugar and experimenting with the chocolate some more. Get the exact recipe on Chef’s Steps, and pull out your scale. You really can’t go wrong if you weigh your ingredients. D, I agree. The salt measurements were a bit wacky. Glad you figured it out. My memory is so bad that I can’t remember whether or not I made the peanut butter version. I guess I didn’t. I remember being hung up on whether to try it or make the Cook’s Illustrated pb recipe. Anyhow, ChefsSteps is a cool site. I need to go beyond cookies and try some of their other recipes. I finally managed to get a health food store to order in the pastry flour for me. It’s not available at stores here. I tried the peanut butter version of this cookie that is posted on the Chef Step chocolate chip cookie recipe. Oh my! Excellent. The complaints on the site are regarding the saltiness. I did 1 1/2 ts of blue box kosher salt and I thought it was great. Weighed all the main ingredients. Now I need to try this original version. Thanks! Sue, I’m not sure why they put weights in for the salt and baking powder. Most normal scales will not weigh those tiny amounts correctly. I think you’d need a special jewelry scale or or pharmaceutical scale to weigh that accurately. Or maybe my scale is just low tech! I kind of made these cookies. I used AP flour because I kept forgetting to buy pastry flour. I used Guittard chocolate chips. I went over to Chef Steps to read their recipe and weighed my ingredients. My salt is Diamond brand kosher salt. 15 grams of it seemed like a horrendous amount so I used 1.5 tsp. 20 grams of vanilla is 4 tsp which also seemed like a lot so I used 3. Maybe my scale isn’t good with small amounts? It’s a digital Soehnle. The cookies are excellent despite all of the ingredient substitutions. Flattening them when they came out of the oven was difficult to do but the result was very even attractive cookies. I would make these again even without special flour or special chocolate. I would measure rather than weigh the salt, baking powder and vanilla. Those look like great cookies. I love when there’s somethings that are a little different with a recipe. I will have to collect some ingredients before I can make these. I will make them. I’ll check out the ChefSteps site too. It sounds interesting. Love the weights. I’ll bet you knew that. I agree, but I’ve had people take that advice a little too literally and complain that the butter wouldn’t mix with the dry ingredients. But yes, if you are using a strong mixer (I actually use a hand held most of the time) and cut the cold butter into bits, you can usually whip it into submission pretty quickly. It seems like the butters with more butterfat seem to soften quicker, too. Thanks so much for the mention! 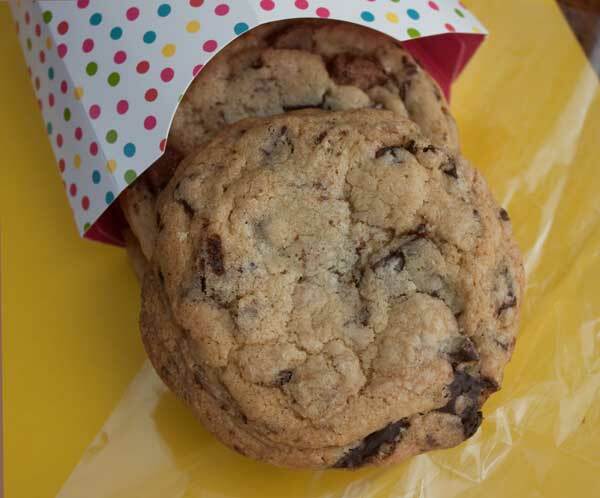 Can’t tell you how much we appreciate you sharing our choco cookie ideas with your audience!! Awesome! To be honest these days with KitchenAid mixers and all, there’s really no need to let your butter come to room temp. Just cut it into pieces, toss into your mixing bowl and start your engine! I think the real key with the butter (and creaming steps period) when making cookies is to make sure you’re not overmixing. Ann, I always use cool room temperature butter. What temperature should the butter be? Room temperature or softer? It’s not clear from your recipe or the one at ChefsSteps.